Craft beer can be a bit of a misnomer. The name connotes a kind of quality that is often a component of the beverage but isn’t an actual requirement of the final result. To say that all craft beer is genuinely ‘crafted’ isn’t entirely true. To qualify under the umbrella of ‘craft beer’, a beer simply has to be produced from a small enough brewer in a small enough quantity. Much of the time, the term microbrew is a more accurate description of the small-run beers we buy and consume. Luckily, the Kitchener-Waterloo area is growing, and not just physically: the culture inside of this city is burgeoning, and a focus on farm-fresh food and locally, creatively crafted – yes, actually crafted – drinks is becoming ever-more present, creating a real community and taste that is unique to the area. Luckily, the microbrews in this area truly do qualify as ‘craft beer’ producers. And that’s fortunate, because it’s impossible to deny the popularity of craft beer these days. Most recently, alongside the Oktoberfest celebrations heavily sponsored by the bigger brewers, a special event highlighting thirty smaller brewers from around Ontario was held. Szaflarska – and by extension TWB – recognized the importance and the excitement of craft beer. TWB specializes in a great deal of different flavours, different ideas, and keeping things within the community. “We can offer a lot of different flavours, often very locally based,” she said. What’s especially unique about the craft beer business model is how it is functionally opposed to monopolies. 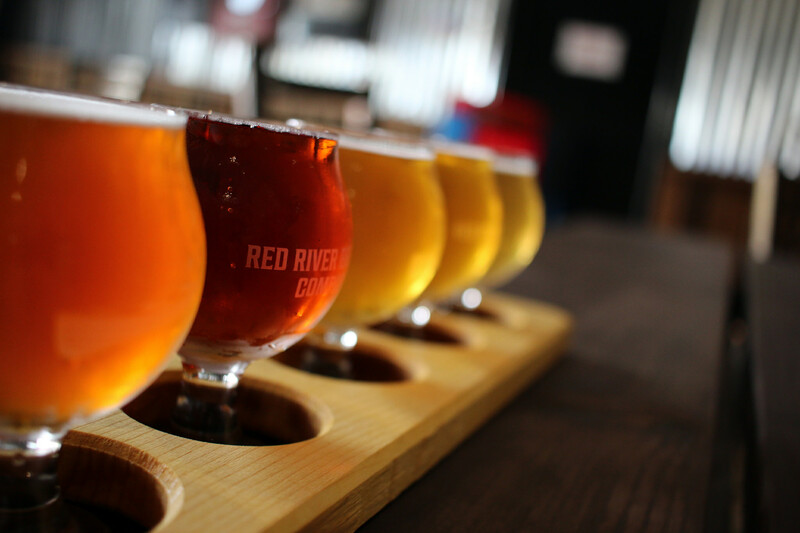 Where one craft brewery succeeds, others tend to be successful as well. But the benefits of drinking local are enormous. Not only are you involved in community operations and conversations, but when you drink craft beer you are benefitting that very same community that you inhabit. “Craft beer drinkers, they don’t tend to stick to one beer all the time,” Szaflarska said, expanding on the co-operative nature inherent to success in local breweries. Crafting beer is so interesting because, while recently functioning especially well as a successful business model, it is rooted in being a fun, interesting hobby. And that makes so many of the local brewers so important: they are themselves fans of craft beer, who get excited about new ideas and new flavours. “We started a beer club a couple [of] years before we started the brewery,” Derek Lebert, one of the founders of Block Three Brewing said. Most of all, because craft beer is so dependent on a local clientele, it makes the effort to stay current. “We try to do seasonal beers that kind of tie into what’s going on in the season, and different events locally and stuff like that,” Lebert said. It’s difficult – on a student budget at least – to drink craft beer. The macros have bigger distribution bases and more product which obviously allows them to sell at a lower cost. But the benefits of drinking local are enormous. Not only are you involved in community operations and conversations, but when you drink craft beer you are benefitting that very same community that you inhabit. When your dollars stay local – when your dollars support your neighbours – everybody wins. Block Three is one of the more experimental brewers in the area, located a hop skip and a jump down King Street in St. Jacobs. Their flagship brew is the immensely popular King Street Saison, which features tasting notes of coriander and bubblegum. But they experiment regularly with all sorts of beers, especially now with the ever-popularizing sour-style. From strong, dark Belgian Quads to wit-beers brewed with coconut and lime (East Wind, a collaboration with FollyBrewpub out of Toronto), this brewery creatively riffs on both new and classic styles. TWB takes the ethos behind a great deal of craft brewing and has turned that same love of community into a business model. As a co-operative company located in Kitchener, TWB is owned and operated by the same people, instilling a direct, intimate connection between the staff and their products. Their most popular brew is the Wobbly Wheel American style IPA, boasting flavours from nine different hops. Innocente capitalizes on the skills of one of the more interesting brewers in the area: their head brewer and namesake, Steve Innocente, holds a PhD in molecular biology and performed a Postdoctoral Fellowship studying yeast. This knowledge and experience are combined in the output of the Waterloo brewery, creating a variety of different delicious, award winning beers. One of their best is the Charcoal Porter, which won Gold at the Canadian Brewing Awards, featuring hints of coffee and chocolate. Set up as a European-style bierhalle in Kitchener, Descendants sells a handful of original, local beers boasting some of the best designed cans in the region. Their three standards are Harbinger, an American Pale Ale, El Buscador, an accessible light lager and Reynard the Fox, a smooth rye ale. Abe Erb is now a pair of brewpubs in the Kitchener-Waterloo region. Their restaurants focus on capturing a cool, mostly locally sourced menu, and brewing awesome beers to pair it with. Last year they broke into liquor stores across the province with their Kölsch style lager, 1857, which is a light, accessible beer that can definitely appeal to drinkers who haven’t quite been able to pull themselves away from the macro-brew ‘fizzy-toast’ taste of Molson and Labatt. This brewery is also one of few in Ontario that has experimented with ‘milkshake ales’ – beers brewed with lactose sugar, which gives them a creamy, sweet taste.